Color Bernie Sanders unimpressed with President Trump’s address to Congress. The US senator from Vermont recorded a 14-minute long video after the speech Tuesday night railing against Trump for not just what he said, but what he didn’t say. In a video posted to Facebook, Sanders said that Trump failed to touch on issues like income inequality, criminal justice reform, and climate change. “I did not hear President Trump say one word, not one word, about the need to combat climate change, the greatest environmental threat facing our planet,” Sanders said. The video took on the tone of a rebuttal to Trump’s address to Congress, even though Sanders wasn’t tapped to offer that response. Instead, the duty went to former governor Steve Beshear, who implemented the Affordable Care Act in deep-red Kentucky. Beshear delivered the rebuttal from a diner in Lexington, Ky., surrounded by residents. 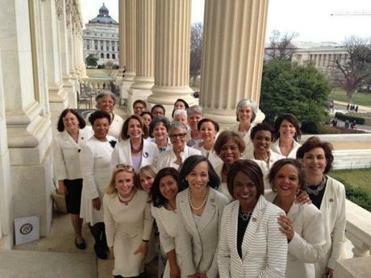 Noticed a lot of female lawmakers wearing white during President Trump’s Tuesday speech? It was no accident. Sanders also slammed Trump for proposing an increase in military spending. He also called for money instead to be shifted to help American students pay for college. “Do we add another $80-plus billion to the Pentagon, or do we allow every qualified young American the ability to go to college tuition-free at a public college or university and reduce student debt? I think the choice is clear,” he said. The senator also expressed displeasure with Trump’s plans on repealing the Affordable Care Act, colloquially known as Obamacare. “Tonight, President Trump once again made it clear he plans on working with Republicans in Congress who want to repeal the Affordable Care Act, throw 20 million Americans off of health insurance, privatize Medicare, make massive cuts in Medicaid, raise the cost of prescription drugs to seniors, eliminate funding for Planned Parenthood, while at the same time, he wants to give another massive tax break to the wealthiest americans,” Sanders said.